Goldie recorded their first win over Isis since 2010 as they convincingly beat Oxford in the Men’s Reserve Race. The race conditions felt unique with hardly a breath of wind and a grey, gloomy, almost dark lighting. This was accompanied by calm water, almost mill pond conditions, for most of the race, though a slight headwind in the run up to Harrods and after Hammersmith Bridge, ensured some slightly choppier water in the middle of the race. Both crews got off to a good start with Isis rating 45.5 and Goldie rating 45. The crews raced side by side in close contention all along the boat houses, with clear water between the two boats. Goldie showed better early boat speed, however, and by the Black Buoy had edged out an early advantage of a seat or two. Isis were rating 35 and Goldie 38. The crucial part of the race evolved around Barn Elms and the Fulham Bend, where both crews were warned separately in quick succession. Isis were then warned twice, there was a minor clash, followed by a “Both Crews” warning. Goldie had extended their lead to half a length at this point and both crews were rating 36. Passing Barn Elms and approaching the Mile Post, both crews were warned, particularly Goldie who successfully took the better water and held their station around the Middlesex bend, where they had the natural advantage of the inside of the bend. With the better line, they capitalized on their lead and pushed out to ¾ of a length after the Mile Post and in sight of Harrods. At the Mile Post, Goldie led by 2.3secs. They pushed hard in this section and established their dominance of the race, but continued to receive warnings from the Umpire. Isis rowed with determination and stayed in contention. Coming up to Harrods, Goldie were rating 35 and Isis 34, but both crews were forced to drop their rates as they hit a firm headwind and bouncy water. 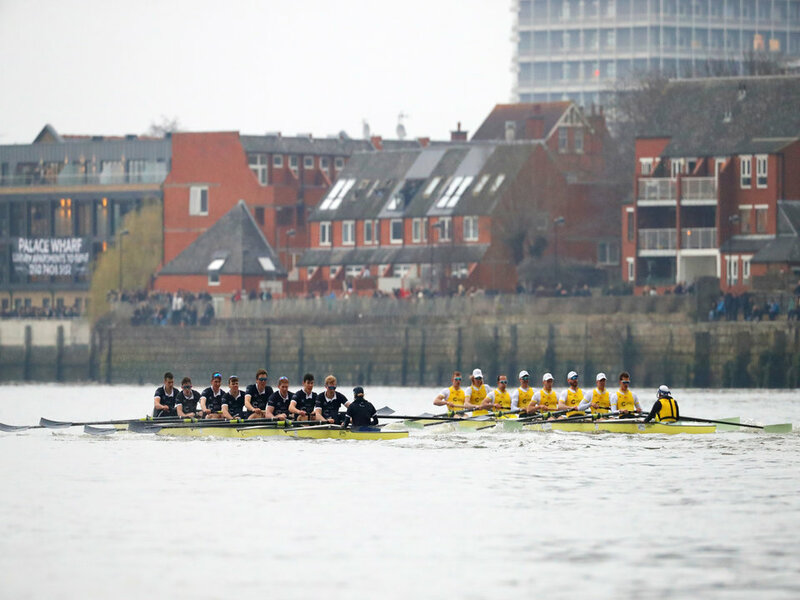 While both crews were noticeably affected, Goldie appeared to handle the conditions better and, coming through Hammersmith Bridge, Goldie had increased their lead to just over one length. Isis fought hard to stay in contact and maintained their position for a significant distance. The conditions improved markedly coming up to and past Chiswick Eyot, with no wind, calmer water, and hardly any stream noticeable from some of the fixed buoys that the crews rowed past. The crews were able to raise their rates in the better conditions, with Goldie at 35 and Isis at 34, and Goldie pushed home their advantage and increased their lead, but continued to row on a different line from Isis. Both crews remained close to one another passing Chiswick steps five seconds apart from each other. Goldie came through this time point in a time of 11:06 while Isis passed at 11:11. At the 12.50 minute mark, after Chiswick steps and in very benign conditions, Goldie had sufficient lead to move directly in front of Isis and to further extend their advantage. Isis were rating 34.5 and Goldie were rating 34. By the Bandstand, and in the absence of any significant stream, Isis had swung across to Middlesex to cut the corner. While this may have given them a small advantage, Goldie’s lead was unassailable by this stage. With good water and little wind, Goldie maintained their lead between Barnes Bridge and the finish. Goldie and Isis increased their rates to 36 and 34.5, respectively, in the final push for the line and the finish. Goldie crossed the finish line with a lead of 2½ lengths over Isis.